Gun Media have announced the Ultimate Slasher Collector’s Edition of Friday the 13th for early September. It’ll include a lot of extra items, both digital and physical. The price tag is $70, which is not bad, but considering it’s a dying game due to legal reasons, the value of the purchase is questionable. On September 4th, the people behind Friday the 13th are going to release the Ultimate Slasher Collector’s Edition of the game. It includes a ton of DLC stuff, as well as two physical items. It will only be available on PlayStation 4 and Xbox One. This edition of Friday the 13th is already up for pre-order on Amazon. It’ll set you back $69.99 if you choose to pick it up, which is not a bad price for what you’re getting. So, what exactly are you getting in the Ultimate Slasher Collector’s Edition of Friday the 13th? For one, you’ll get a copy of the game itself. You’ll also get all of the DLC that has come out since launch. This includes all Kill Packs, an Emote Pack, and Clothing and Costume Packs. Then, we get to the physical items. 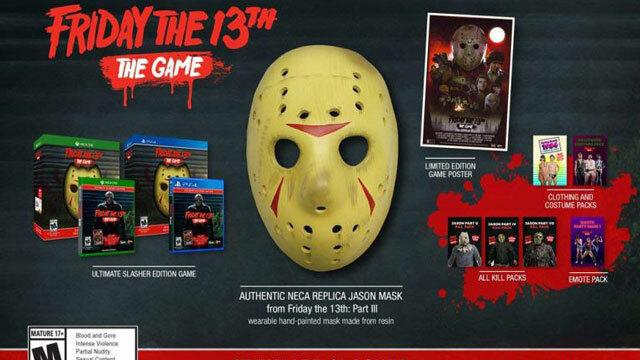 Included are a limited edition poster for the game, and an “authentic NECA replica Jason mask.” The mask is from Friday the 13th Part III; it’s wearable, hand-painted, and made of resin. Now, I’ve said that this is not a bad bundle for the money, and I stand by that. What I don’t stand for at all is the bigger picture here. As we’ve covered before, the lawsuit happening around the Friday the 13th franchise has hit the game. The developers have since come out and stated that they won’t be releasing any new content in the future, at all. So, that means you’ll be paying $70 for an essentially dead game, and I’m not too fond of that. It really makes this move come across as a last, desperate cash-grab from Friday the 13th fans.